1. A player breaches a Rule and includes the appropriate penalty on the score card that they sign and return. 2. 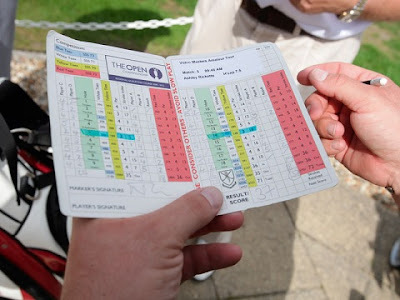 A player unknowingly breaches a Rule and signs and returns their score card. The breach is brought to the Committee’s attention before the competition has closed. 3. As in 2, but the breach is brought to the Committee’s attention after the competition has closed. So what are the considerations in each of these four scenarios? 1. This does not require any further explanation. It is what should happen every time a Rule is breached. 2. If the breach is brought to the attention of the Committee before the competition has closed, the player incurs the penalty prescribed by the applicable Rule and an additional penalty of two strokes, Exception to Rule 6-6d. 4. Call it what you like, but this is cheating. The player must be disqualified and the Committee should consider sanctioning them, e.g. by suspending them from all competitions for a period of time. • which ball he wishes to count if the Rules permit the procedure used for that ball. Before returning his score card, the competitor must report the facts of the situation to the Committee. If he fails to do so, he is disqualified. If the competitor has taken further action before deciding to play two balls, he has not proceeded under Rule 3-3 and the score with the original ball counts. The competitor incurs no penalty for playing the second ball. There is a more detailed explanation of Rule 3-3 in this blog of mine. Sergia Garcia getting relief from a really bad lie in a water hazard. Ben Crane receiving two four-stroke penalties and then disqualification, because of the clubs he was carrying.